I used bids protect my clothes. This is a must have for the elderly. no negatives. perfect size and good quality. I love this product! It's great for both handicapped (I worked with the handicapped) and non handicapped adults! I bought these for my daughter and son-in-law, both are size 3X adults, and the neck size fits a very large man! They are heavy enough to stay flat on the body... over sized to protect the entire front of an extra large adult! These are being used for protecting clothing while eating at home... they were staining way too many shirts! Much nicer than others I have found, quality is excellent, like a thick thirsty towel! The Blue I bought was deep and rich in color! Husband always eats in his recliner and works great. Gave to 93 year old man. He loves it .Vercro fastner makes it easy to use. These bibs were a Christmas gift for my 102 year old mother. They will really help keep her good clothes clean so she is more presentable when company just drops in. Such a good idea for the velcro closing she can handle herself. Husband had surgery and eats sitting in a chair. It protects PJ's from dinner spills. I bought this product for a friend of mine ,she loves it . Any time she eat she feels her clothes well protected from stains.for this reason I will order myself and my other friends. I ordered one for my husband also. As you can imagine, he was not thrilled, but when I told him he did not have to wear it when we had company, he agreed it was a "spot saver." I usually have a salad for lunch while watching a tv program. It covers me so I don't stain my clothes. WASHABLE . LOVE VARIETY OF COLORS. GREAT FOR ELDERLY EATERS. These are great for any age and protect your clothing while you're eating and doing other things. These are a must-have for any adult who has difficulty feeding him- or herself. Washes well. Wears out more quickly than I espected but does the job. I bought more, and this time they seemed sturdier.Easy to fasten with Velcro. 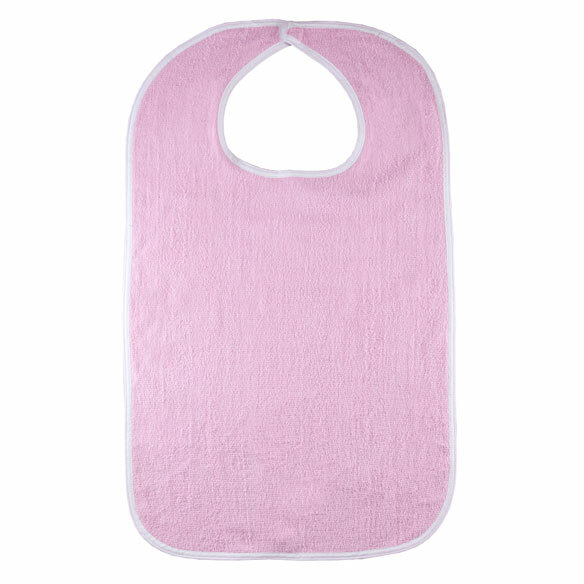 These terry adult bibs are perfect for home and I keep one or two in the car because we often travel and choose to eat while traveling. I also use these for my 96 year old father. Love the generous size! My husband needed this bad to catch his food . Great Christmas gift, works well to keep stains off your clothes. This was a gag gift for my "aging" sister, but an item that will come in handy and save her clothes. She loved it. the quality was very nice and big enough for the "full bodied" ladies. Will order again. I have no further comments. Make the neck so it can be adjustable. I only give reviews when I am unhappy with a product. This is the best thing for cooking. Keeps messy hands clean. This is great for small messes on your hands when cooking. Love it! 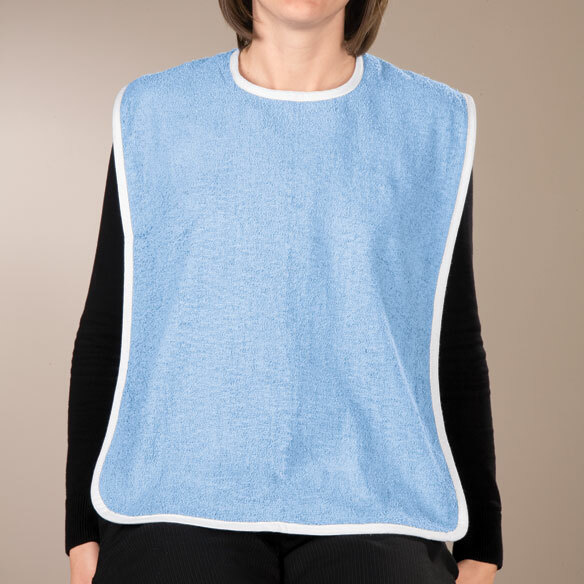 The adult terry cloth bib is exactly what I wanted! I was looking for a cover up to save on laundry! 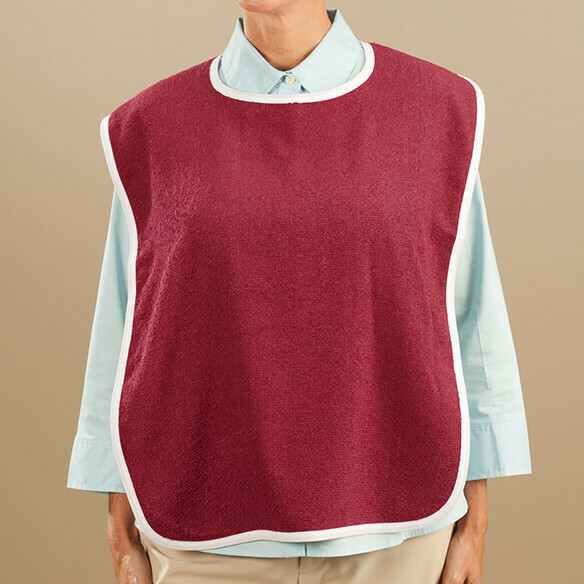 I transport a handicap boy and saw that his mother uses tee shirts as bibs so I have bought many bibs in different colors for him. It looks so much better than the tee shirts and it really serves the purpose. WHEN EATING AN ITALIAN MEAL. The neck fits around and fastens, best of all--the velcro stays hooked!! After surgery on shoulder, I need to protect clothes during eating & drinking. Good value, and great item to have on hand. Had this on hand when we traveled to visit senior family members who we take out for meals. Easy to put on. No tying. GREAT SIZE & PRODUCT FOR DISABLED OR SHAKY EATERS. I was tired of tying and untying apron strings. This works perfectly for me. I use this to help keep my tops cleaner when I eat. I spill,or drop food on my tops all the time. saves a lot of clothes from stains. I purchased these bibs for my friends and they loved them. They keep the food and stains off your clothes well. So happy to NOT be wearing my meal! I use my bib to protect my clothes when I eat and when I am crafting. My husband has Parkinson's Disease. These bibs are very helpful in keeping his clothes clean when he eats a meal. Thank-you. It works like it is suppose to. Wish the velcro was just a bit longer so it would fit around the neck a bit better, other then that it okay. It would be better if it had a vinyl front instead of terry cloth, easier to keep clean & free of stains. I use this as abib when I' eating to protect my clothes. the material is good but could be a little thicker. I was trying to place a bib that I had that has a shield in the middle of it. 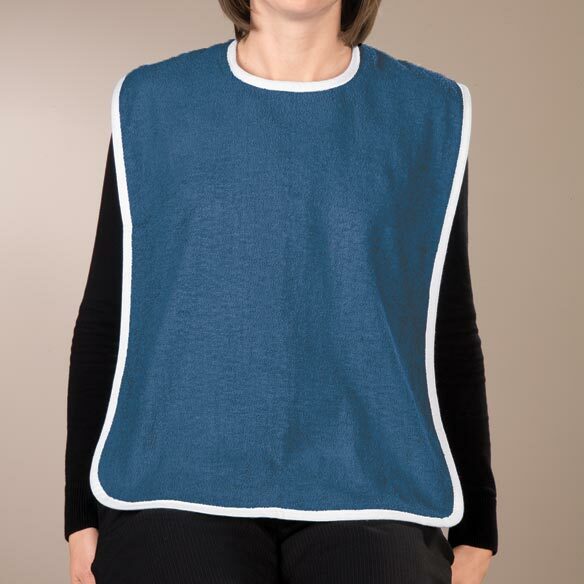 very pleases with the bibs in fact have ordered more of them . Length is good and do up nicely when washed and the ones I have been washed about every day. 2) when the Velcro is not put together it will snag the bib. I feel the bibs are made of cheap material, but the neck hole is nice and big and they serve the purpose. The colors are nice...I got burgandy and navy. I have bought 5 for mom in asst. liv. they help, but need to be much longer &wider to cover the lap. also thicker. she also uses it in bathroom to cover & brush teeth, a chore after stroke, but helps to not get paste all over her shoulder and down her front. needs to be fuller and longer, even for greater cost. that would eliminate spots, & prewashing so many clothes. they also grow legs and disappear at facilities so buy multiples. I was disappointed--I though it was waterproof. Loops in terry hold food. Oatmeal stayed even when washed in hot water. Used as wiping cloth until too dirty and disposed. the velcro tabs only last through one washing. do not waste your money. I plan to use them on my great grandsons to keep their clothes clean when they eat. Hope they work! Can't believe how much I spill stuff on myself - save having to take things home and wash right away. size and price - my current one wearing out. My husband has Parkinsons and need assistance eating. 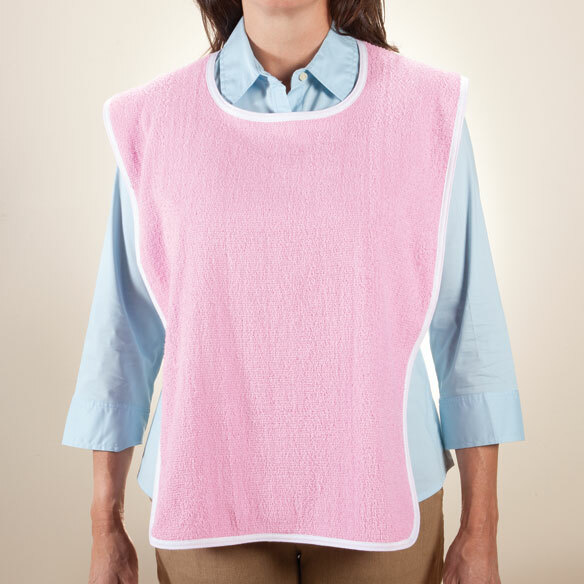 Easy to put on, large bib area, easy to wash and dry. Remains soft and comfortable to wear! Have Muscular Dystrophy and mobility is limited, weak and sometimes messy. I drink coffee in bed and I just don't want my clothes to get dirty. MIL has one already and loves it. Have used previously at home and love keeping my wash at a minimum (lol). W ill help keep my clothes clean when I eat. For use of resident of a nursing home. I got it fir my Dad. He seems to like this style because it isn’t so close to his neck. He also likes it because the velcro seems to hold better. Elderly parent resides with us. For a friend who lives in a nursing home and has difficulty eating with utensils. I'm a slob and this should keep my clothes clean. I care for my 96 year old Mom, on many occasions. Had this bib before, and it worked great. Want more to keep on hand, and send one home wiith her. Keep clothing clean when eating spaghetti ,etc. I am 85 years old, and I dribble! to assist my husband when brushing his teeth or shaving to avoid spills. Priced very reasonable. Good size. So I would have to wash my clothes as often.